The taste of early spring spinach often reminds me of the description of rapunzel in the fairy tale of the same name. Tender leaves of a fantastically GREEN vegetable that somehow seems exotic and forbidden all at the same time, it demands and deserves the kind of respect we rarely accord vegetables. You’ll be seeing me cook with spinach several times this week in a variety of styles, ranging from a simple Italian treatment to a stir-fry to an ingredient in either risotto or soup. But since this is the weekend, I’ve granted myself license to cook and eat with abandon before returning to the cold reality of the work week. As far as I’m concerned, there’s nothing richer or more satisfying than the following dish, where spinach and kale take on an almost silken lusciousness after being slowly poached in melted butter. It’s like creamed spinach, but for adults. This is a version you’ve never had before. Adapted from this article by Mark Bittman of The New York Times. Melt 2 tablespoons butter in a deep skillet over medium-low heat; add a quarter of the spinach and kale. Cook, stirring occasionally, until the vegetables have absorbed the butter; then add another tablespoon butter and more spinach and kale. Stir; repeat until the spinach and kale have all been used. Add 1/2 cup light cream and cook until the cream is slightly thick, at least 15 minutes. Taste for salt and pepper. Grate some fresh nutmeg over and give a final stir. 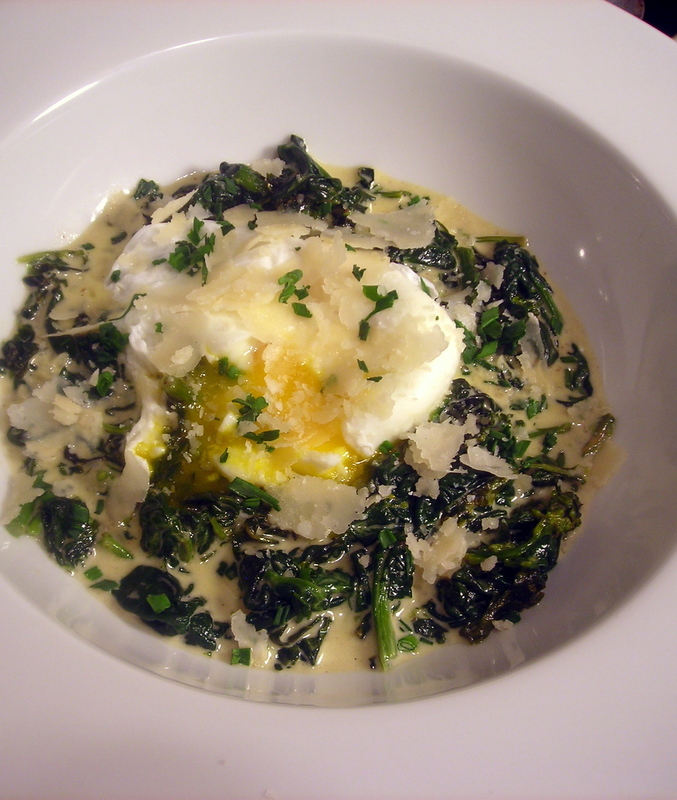 To view a demo on how to poach an egg, click here. To assemble: Spoon spinach and kale into a shallow bowl. Top with a poached egg. Shave some Parmigiano-Reggiano cheese, sprinkle with minced chives, then serve at once. Time: About an hour, including prep. 09 Apr	This entry was published on April 9, 2012 at 1:17 am. It’s filed under American cuisine, cooking, food, food photography, Gluten-Free, New York City, recipe, spring, vegetarian and tagged dinner, eggs, food photography, gluten-free, kale, Mark Bittman, spinach, vegetarian. Bookmark the permalink. Follow any comments here with the RSS feed for this post.